We were wondering whether there were lovers of art song in Brooklyn before Michael Brofman established the Brooklyn Art Song Society. Watching the growth of B.A.S.S. over the past seven years hints at Mr. Brofman's dedication to producing an excellent series that has attracted an ever-increasing audience. Clearly, word has gotten out because last night the house was packed in spite of the arctic shiver in the air. BASS' programs are always compelling and this season has been devoted to French mélodie. Last night's program focused on music of La Belle Époque, the half century prior to the First World War, a time when Paris was the center of culture, much of it avidly consumed by the bourgeoisie. Opening the program was the engaging soprano Kristina Bachrach with Mr. Brofman himself at the piano, offering songs by Gabriel Fauré, each one a precious gem. Ms. Bachrach is a polished performer with great stage presence; she employed fine phrasing of Fauré's long Gallic lines and excellent French pronunciation, along with just the right amount of expressiveness. We enjoyed the lively "Mandoline" which always makes us think of Fragonard's paintings, although he died before Verlaine wrote the text which was set by Fauré. We were less familiar with "Le Secret" with it's lovely text written by Armand Silvestre, here performed with great tenderness. In "Après un rêve" Ms. Bachrach made good use of word coloration and dynamics to paint an aural portrait. "Clair de lune" gave her the opportunity to show the brilliance of her upper register. "Les roses d'Ispahan" showed off Mr. Brofman's artistry in bringing out the exotic nature of the melody. We were quite excited about hearing the marvelous baritone Michael Kelly who always astonishes us with the depth of his involvement with the material he sings. But last night his being "on the book" severely impaired his involvement with the audience and left us cold. When this happens, our attention generally turns to the piano and this was a revelation. Dimitri Dover, a pianist we have always enjoyed, was in top form limning Emmanuel Chabrier's arpeggi in "Chanson pour Jeanne". His handling of the repeated chords in "Tes yeux bleus" with emphasis on each minor change clearly demonstrated Richard Wagner's effect on Chabrier. We have long enjoyed Henri Duparc's setting of Charles Baudelaire's "L'invitation au voyage" but have never heard Chabrier's setting which involves the addition of the bassoon. We love the sound of this instrument and it was a treat for us to sit but six feet away. It was quite an experience, adding depth to the sonic tapestry. Countertenor Eric Jurenas lent his lovely instrument to a quartet of songs by Reynaldo Hahn. We adore that fach and our companion, who generally does not, loved his performance as much as we did. Hahn's melodies stayed with us all night and are still spinning around in our brain. Hearing these songs sung by a different voice type was a special treat. Mr. Jurenas has a very appealing vibrato and just about the clearest French we have heard in a long while. Looking at the text was totally unnecessary; every word was understood. Victor Hugo's text "Si mes vers avaient des ailes" is a song that depicts what songs do. Indeed, Mr. Jurenas' expressive voice gave wings to Hugo's verses. Another favorite of ours is "À Chloris" and Mr. Jurenas sang it as expressively as we have ever heard it and Mr. Brofman's piano brought out the turns that lend such interest to the simple melody. The second half of the program comprised Hector Berlioz' group of songs "Les nuits d'été" with text by Théophile Gautier. Mezzo-soprano Annie Rosen and collaborative pianist Daniel Schlosberg partnered beautifully in these evocative songs. We have often heard Berlioz' orchestration of these songs but last night we heard the original piano and voice version. 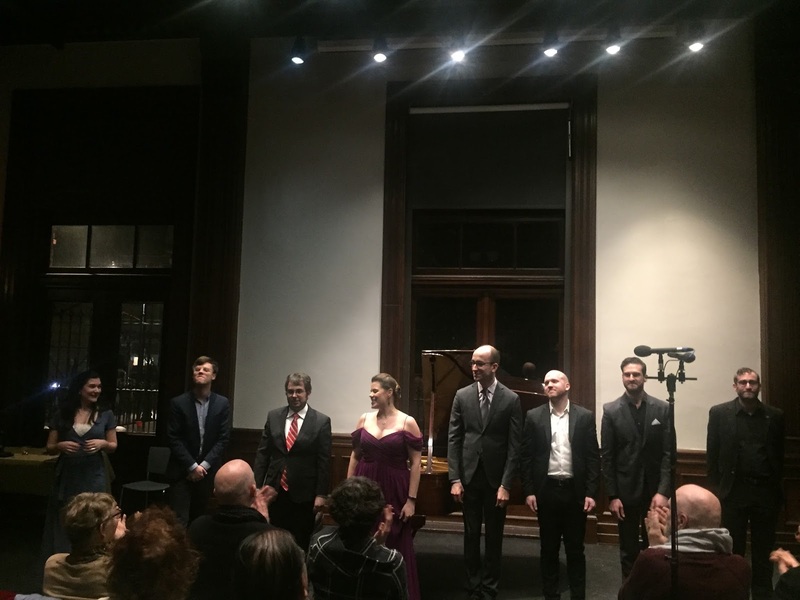 We are not sure what the songs have to do with summer nights after the opening "Villanelle", a charming and tuneful song that produced images of Spring on the coldest night of the year (or perhaps the coldest night of the past several years). "Le spectre de la rose" expresses a gorgeous sentiment that Fokine used as inspiration for a ballet. (However, the choreographer used music by Carl Maria von Weber). Ms. Rosen's expressive singing brought the story to vivid romantic life with some hopeful upward leaps. She used entirely different coloration for the sorrowful "Sur les lagunes" which employed the lovely lower register of her instrument. We thought "Absence" fit her voice perfectly and it wound up being our favorite song of this group. The closing song "L'ile inconnue" was most revealing of Ms. Rosen's personality. It was altogether a sublime performance.